Has anyone else noticed their FTTP slowing down after being connected for a while? I'm on the trial getting 100/15 and if I try a speed test from a hard wired PC I get about 92MB which is great. However if the router and ONT have been powered up for a while I notice when performing an iPlayer download on an iPhone that it just seems to go slow. A one hour program (640MB-ish) can take ages to download. If I reboot the router and ONT and restart the download it will complete in about 7-8 minutes. Which router are you using? Do you notice the slow downs at a particular time of day or anytime? 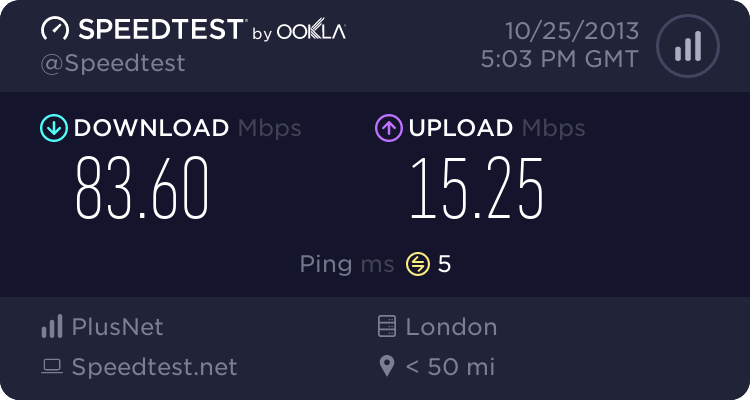 I've noticed some slow downloads on iPlayer through my Sky box, but when I did a speedtest.net test it came back at normal line speed. I've got the Plusnet issued Netgear WNR3500v2. The slow downloads are usually late evening and as I said before, if I reboot the router and ONT they instantly speed up dramatically. I think it's best to raise it as a fault. Does rebooting just the router improve things or do you also have to reboot the ONT to see an improvement? I'll have to try just the router again. I got into the habit of rebooting both as the router seemed to have difficulty reconnecting when I just rebooted that. Is the problem still occurring? It might be worth setting up a TBB Graph (http://www.thinkbroadband.com/ping) to monitor your line. The only issue is if you have a dynamic IP, you would need to create a new graph every time you disconnect/reconnect. It is still doing it and I've determined rebooting just the router works as well. I'm going to set up a thinkbroadband monitor from the link you sent but it will have to wait until I get home. I was just in the process of setting it up and realised I had ping response blocked on my router. I've got a fixed IP so no problem there. I reckon it might be something to do with your router. Have you tried updating to the latest firmware (if there is an update)? Another thing you could do is sign up for a free SamKnows Whitebox (https://www.samknows.eu/). This is basically a router that runs various tests throughout the day and allows you to view the results via an online portal. It's pretty comprehensive and has the advantage of running a lot more tests than just download/upload speeds. As it randomly runs the tests throughout the day, you can pinpoint any specific timing of issues. Yeah it would seem that your problems are related to those on the other thread. Bit of a strange one though...not quite sure where the problem might be and why only certain areas of MK are/were affected. It seems to be back to normal for you now though, so maybe there was some config problem or something needed to be rebooted?